Your body's immune system is like a security guard that protects your body from infections and diseases. Unfortunately, your immune system can go awry and mistakenly attack healthy cells in your body. This is called an autoimmune disorder. More than 50 million Americans are fighting with autoimmune diseases, but it is still not clear exactly what causes autoimmune disorders. They can be genetic though and run in families, with Hispanic-American, African American, and Native-American women more at risk of developing a disorder. There are more than 80 types of autoimmune diseases, and some of the most common ones are mentioned below. The immune system cells attack the joint and produce swelling, inflammation, and pain. If left untreated, it may lead to permanent joint damage. The disorder produces autoimmune antibodies that attach themselves to tissues in your body and affect the joints, blood cells, lungs, kidneys, and nerves. The immune system starts destroying the lining of the intestines that may lead to diarrhea, urgent bowl movements, rectal bleeding, fever, abdominal pain, and weight loss. Crohn's disease and Ulcerative colitis are also the forms of inflammatory bowel disease. In this disorder, your immune system destroys nerve cells, causing blindness, pain, poor coordination, weakness and muscle spasms. Your immune system attacks and destroys insulin-producing cells in your pancreas and lead to diabetes mellitus. In this autoimmune disease, the immune system destroys your nerves that control muscles in the legs. It may also affect the nerves in the arms and upper body. 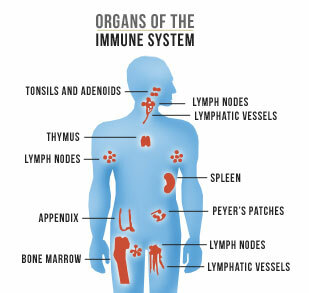 You suffer from psoriasis when immune system blood cells (T-Cells) start accumulating in the skin. This often produces silvery, scaly plaque on your skin. In this disease, the immune system affects your thyroid gland and increases the level of thyroid hormone in your blood. The symptoms include weight loss, bulging eyes, rapid heart rate, nervousness, and brittle hair. The immune system attacks and destroys the cells that produces thyroid hormone, leading to symptoms such as constipation, fatigue, depression, weight gain, dry skin, etc. The immune system produces antibodies that attach to nerves and restrict their ability stimulate muscles. Your blood vessels are usually the target of the immune system in this autoimmune disorder. What Are the Common Symptoms of Autoimmune Diseases? As there are so many types of autoimmune deficiencydisorders, the symptoms vary a lot. The symptoms may differ a bit because autoimmune diseases can affect different parts of your body, including joints, muscles, red blood cells, skin, endocrine glands, and connective tissues. The most common symptoms include fever, fatigue, and general feeling of being unwell. Whatever the symptoms, they tend to get worse during flare-ups. It is important to get in touch with your doctor as soon as you develop some symptoms of an autoimmune disorder. What Are the Causes of Autoimmune Diseases? Under normal circumstances, the immune system's white blood cells will protect your body from harmful substances, including viruses, bacteria, cancer cells, and toxins. After the onset of an autoimmune disease, your immune system cripples and fails to differentiate between healthy body tissues and antigens (bacteria, viruses, etc. ).This leads to an immune response that destroys healthy body tissues. Sometimes a normal body substance changes shape due to a drug, virus, radiation, or sunlight and is taken as foreign body by your immune system. These virus-infected cells may trigger your immune system to attack. A foreign substance that looks like a natural body substance enters the body and the immune system targets the similar body substance along with the foreign substance leading to autoimmune reactions. In some cases, B cells, a type of white blood cell, malfunction and overload your body with abnormal antibodies that start attacking some of the body' healthy cells. A substance that may be in the body but is usually hidden from the immune system may trigger autoimmune response when it enters into the blood stream. For instance, if something hits your eye and the fluid in your eyeball enters your bloodstream, this will produce an autoimmune response, as the immune system will take it as a foreign substance. In addition to these, there are many other situations when it is not evident exactly what triggers an autoimmune reaction or disease. Heredity has a role to play here, as some people are usually born with genes that make them vulnerable to autoimmune disorders. What Are the Treatments for Autoimmune Diseases? Supplements may help replace a substance that your immune system is destroying, such as vitamin B12, thyroid hormone or insulin. Blood transfusion is an option if your immune system is affecting your blood cells. Physical therapy is usually the treatment choice when an autoimmune disease is affecting joints, bones, and muscles. Sometimes, your doctor may prescribe some immunosuppressive medicines to limit your immune system's abnormal response. Some of the common choices are corticosteroids and non-steroid drugs such as cyclophosphamide, azathioprine, sirolimus, or tacrolimus. The following video will share some more quality stuff about autoimmune diseases. Check it out, now!